The powder has fallen, the snow has settled and it’s time to get out into the backcountry; which gear to take? For those of us who find our souls free enough with our heels locked down, but don’t love post holing AT is the answer. A cross breed of telemark and alpine, AT bindings allow alpine skiers to skin up backcountry hills with free heel ease yet lock down for alpine descents and in-bounds skiing. Our alpine personalities want torsional rigid bindings with step-in convenience that auto release in a crash. Our touring personalities demand various post heights for easier climbing, lighter weights and ergonomic platforms. The locking mechanisms of AT bindings clamp the heel down for traditional alpine-binding like performance, while the hinged toe and lifters keep the boot perpendicular to the slope while the ski climbs uphill. Both sides agree the components need to be strong. At least four companies have taken on the challenge to meld the split personalities of AT bindings, relentlessly making technical advances. For skiers likely to spend most of their time hiking for out-of-bounds powder turns, Dynafit bindings may be their best choice. One lightweight model weighs in at only 1 lb. 4 oz (compared to the competitor’s 4lb binding on average) making climbing easier, while preserving a reliable boot retention system for placid descents. The downside is minimal; the bindings require an extra step to switch from hiking to skiing mode and only work with specific boots. Oppositely, Fritschi, Naxo and Silvretta focused on performance, to create durable bindings for hucking cliffs, hitting kickers, carving wicked fast groomers and descending sick steeps. The performance bindings also incorporate pressure sensitive toe release systems. Fritschi’s comparatively heavy binding with a DIN setting of 12, is capable of handling smaller drops and variable snow conditions with the proficiency of an alpine binding. It also employs step-in convenience and pole switchable modes as well as built in brakes. Silvretta started the AT revolution and continues to upgrade their bindings, including popular toe and heel release capabilities in a lighter binding with wider breaks for powder skis. The new kid in town, Naxo, takes the next step in AT binding advancement with a pivot system that makes striding uphill easier and a DIN setting up to 14 for bigger cliffs and more aggressive skiing. The formula for choosing AT boots is as simple as a matching game. If you want light touring skis and bindings, get lighter boots, and if you want performance skis and bindings, choose a big stiff boot. Unfortunately, AT bindings are not compatible with alpine boots, as they require a Vibram sole, but since you’ve splurged on the bindings, what are one or two more pieces of equipment to have the perfect ride? If you chose Dynafit bindings, you’ll have to get Dynafit specific boots, luckily Scarpa, Garmont and Dynafit all make compatible boots that are also lightweight and work in non-Dynafit bindings should you ever change your mind. Similar to telemark, AT boots have different purposes ranging from burly, heavy four-buckle high-performance boots for freeride skis, to quick, soft ultra-light low-top boots for comfort when touring. All-mountain boots combine stiff support to drive most skis and lightweight construction to tour all day. Like alpine boots, finding the right fit takes talking to a knowledgeable boot fitter and trying on many pairs. AT liners are removable and the shells can accommodate heat moldable liners. All AT boots have rubber soles and upper cuffs that unlock for movement and comfort while skinning; some also feature a rocker underfoot for hiking. Choosing a ski does not vary much from choosing an alpine or tele ski. Stability and floatation are more important than carving or edging. Lightweight skis are better for touring, while heavier fatter skis perform better on the downhill. If you chose Dynafit bindings and lighter weight boots, complete the package with a light ski. We all dream of endless powder days and are tempted to buy fat skis for that reason. Manufacturers have picked up on this compulsion and are working to develop fat skis that are soft enough longitudinally to float in powder but stiffer torsionally to hold an edge on groomers and cut through crud. AT specific boards are rare, so choose an ultra lightweight, powder, freeride or all-mountain telemark or alpine ski depending on your style and ability. Keep in mind you want less weight and more flex in an AT ski. 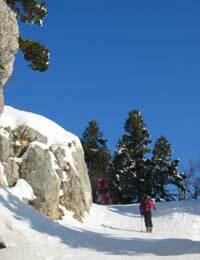 Alpine Trekking gear allows an alpine skier the flexibility of traveling uphill with tele-like ease. While the technology is still developing, manufacturers have taken leaps and bounds as far as durability, weight and convenience, not to mention knee saving pressure release systems.